Well my automotive ADD kicked in again and I sold the Suzuki and am selling the Fiat. I found a car I wanted ever since it was released many moons ago in 2003. 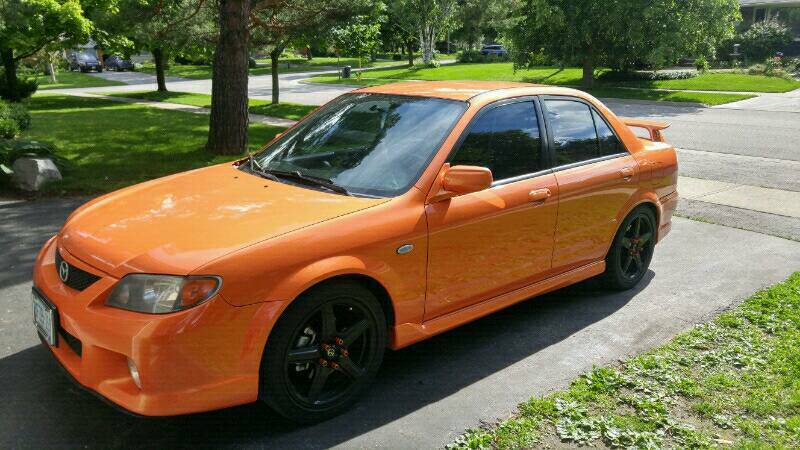 Flew to Barrie this weekend to pick up the new to me 2003 spicy orange Mazdaspeed protege. Had a mini thunder bay car meet with Xchox who was kind enough to pick me up from the airport, let me crash at his place, meet his hot wife, and drive me an hour to pick it up in his mint $500 Saab turbo aero wagon. People who know these cars know how special they are, those who don't just think it's a protege with day-glow orange paint. 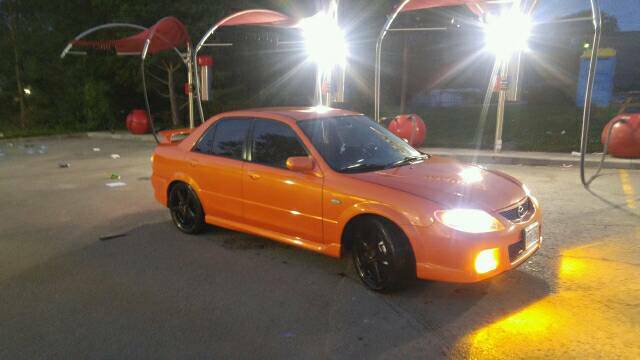 It's the first Mazdaspeed ever made and in this color it's extra rare. Engine had a turbo bolted to it designed by Callaway cars, the guy who made the twin turbo vettes back in the 90s. Limited slip front diff, sparco shifter, nardi wheel, Racing Hart 17" wheels, racing beat swaybars, tokico struts and 4 wheel disk brakes. This one has an upgraded intercooler, aluminum pipes, injen intake, forge bov, POPE high flow turbo manifold and downpipe, 3in corksport exhaust and poly engine mounts. This is the new daily so any extra mods will be very minor but it's a blast to drive as is. Stock they make 170hp and with the current mods running stock 7psi it should be just over 200 at the crank. congrats! I love these proteges...I've liked the mazdaspeed version ever since it was released. I'm very jealous. Nice find! Interesting choice. What a paint colour! Hope motors are easy to find with your turnover rate! Easier to find than a Miata 1.6 or 1.8 lol. Hence why I am leaving it alone for the most part. Last edited by IOM SS; 08-28-2017 at 10:55 AM.